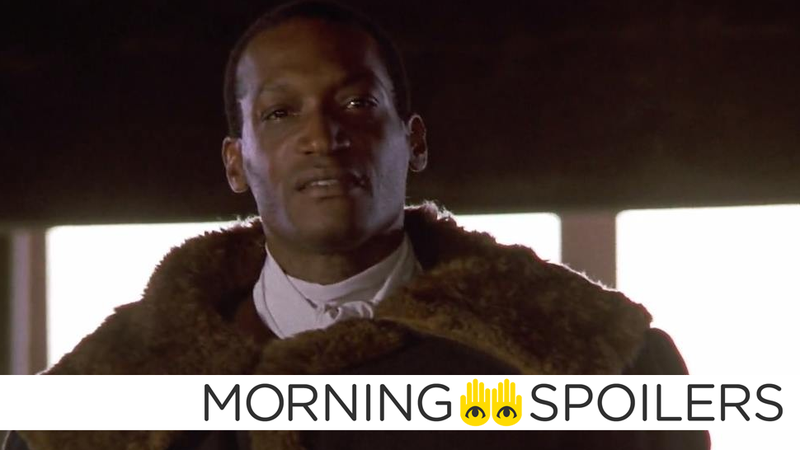 Is the Candyman Remake Close to Finding a Star? And no, it’s not Tony Todd, before you ask. Patty Jenkins thinks her third Wonder Woman movie will be set in the present. Anthony Daniels has wrapped on Star Wars: Episode IX. Plus, Bo Peep returns to Toy Story, a new look at Krypton’s Lobo, and a wild Black Panther 2 rumor comes in courtesy of...Angela Bassett’s husband? Spoilers get! Speaking with Entertainment Tonight at the 2019 SAG awards, Angela Bassett answered, “I would assume so” when asked if the entire cast of Black Panther would return for the sequel. Immediately afterward, Bassett’s husband, Courtney B. Vance, interjected, “Yes, just go ahead and say it, yes! Everyone will be there, including Michael B.” Take it all with a pinch of salt, and whatnot. NBA star Kyrie Irving will star in and executive produce a currently untitled horror film concerning a haunted hotel in Oklahoma, Bloody-Disgusting reports. Anthony Daniels revealed that he—and C-3PO, human-cyborg relations—has wrapped filming on Episode IX. Before a screening of his new film, High Flying Bird, at Slamdance, Steven Soderbergh opined the long-awaited third Bill & Ted movie could see a Christmas 2019 release date. That’d be a good Christmas present. Speaking with THR, Patty Jenkins confirmed the third Wonder Woman movie will be set in the present day. I’m not dying to do another period piece. It was funny, I read an article today on whether it would be in the future or what it would be. … It’s definitely one of the things we’ve talked about. I’m not pining to put it in the past again, because where are you going to go? I think it would be weird. You have to go forward. It’s definitely a contemporary story. That’s all I can say. And so where we put it and how that gets figured out, I haven’t totally nailed down. Annie Potts returns as Bo Peep in the latest promo. And Disney released a poster showing off the character’s new look. Carols splits in three on a new Japanese poster. Entertainment Weekly also has our first look at Nicholas Hoult as J.R.R. Tolkien. More pictures at the link. Shipwrecked sailors encounter a killer siren in the latest trailer for The Isle. Deadline reports Taissa Farmiga, Rhea Seehorn, Luke Kirby and Ike Barinholtz are slated to appear together in an upcoming episode of The Twilight Zone. In a recent interview with HN Entertainment, screenwriter Ed Neumeier revealed a Starship Troopers television series starring the 1997 film’s original cast is currently under consideration. I don’t want to jinx anything, but we are talking about trying to do a television show that is based on that idea. In a recent Twitter post, Kryton’s Cameron Cuffe described the series’ interpretation of Lobo as a glam metal hybrid of the Joker and Wolverine. Meanwhile, Seg-El and Zod face off on a new motion poster. Spoiler TV has photos from next week’s episode, “The Bad News Bear.” More at the link. TV Line also has new photos from Supernatural’s 300th episode, “Lebanon.” Click through to see the rest. Three new teasers introduce us to Robotman, Elasti-Woman and Crazy Jane.